South Korea and China are reaching a new starting point beyond the THAAD feud that has been the biggest challenge between the two countries. Seoul-Beijing ties are showing signs of thawing recently in the economic, cultural and defense areas. 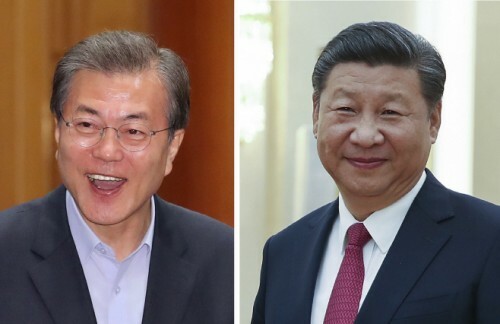 In such atmosphere, the possibility is growing for South Korean President Moon Jae-in and Chinese President Xi Jinping to have a summit, raising hopes for warming relations chilled over the deployment of the THAAD missile defense system on the peninsula. According to Cheong Wa Dae on Sunday, South Korea and China are working to settle the THAAD feud before a possible summit between their leaders during the Asia Pacific Economic Cooperation (APEC) summit to be held in Vietnam on Nov. 10-11. "We are making various efforts to settle the THAAD problem smoothly before President Moon Jae-in and Chinese President Xi Jinping meet during the APEC conference," a presidential official said. "Active working-level coordination is under way." Another official said, "The smooth resolution of the THAAD dispute can be said to be necessary and sufficient condition for a Korea-China summit." Some observers believe that Cheong Wa Dae may announce the schedule of the Seoul-Beijing summit and express its position about the THAAD issue as early as this week if the ongoing coordination between the two countries works smoothly. The coordination between the two countries is said to be focusing on the "future-oriented cooperation" for the summit at the APEC after resolving the THAAD dispute, the biggest obstacle to the Seoul-Beijing relations. In fact, there are positive signs suggesting that the THAAD feud will be resolved soon. South Korea and China recently agreed to extend their currency swap deal. Besides, there are signs that China will lift ban on group travel tours to South Korea for the first time in seven months. Top Chinese cultural official Long Yuxiang, Executive Chairman of China International Cultural Communication Center (CICCC), paid a visit to South Korea on Oct. 12 and expressed his strong will to make efforts to remove China's Hallyu ban as soon as possible. In the military sector, the defense chiefs of the two countries held their first bilateral talks in nearly two years. Such a series of movements is also in line with Xi Jinping's second term that has started with China's 19th Communist Party Congress. Xi is expected to seek active foreign policy based on his consolidated power and position, and is expected to show a flexible position over the THAAD issue with South Korea. This is why Moon-Xi summit during the APEC summit is considered one of the biggest variables to tell the Seoul-Beijing relations in the future. If the summit takes place and the THAAD dispute can be resolved, President Moon will naturally hold a summit with Xi Jinping by officially visiting China. Furthermore, if Moon invites Xi to the PyeongChang 2018 Olympics in February and Xi gives a positive response, the two countries may establish a future-oriented cooperative partnership.